The National Institute of Standards and Technology and the University of Colorado Boulder have demonstrated a portable ground-based system designed to scan and map atmospheric gas plumes. 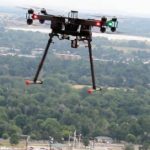 NIST said Friday the “comb and copter” system has potential to search for leaks in gas and oil fields as well as examine the combination of auto emissions and other gases in an area between the earth’s surface and the next layer of the atmosphere. The agency partnered with unmanned aircraft researchers from the University of Colorado’s Integrated Remote and In Situ Sensing team to fly the instrument on a multi-copter and measure location, temperature, air pressure and path length of gas concentrations. The Defense Advanced Research Projects Agency helped fund the development of the laser instrument equipped with a pair of frequency combs that work to identify and analyze gases based on absorbed light.